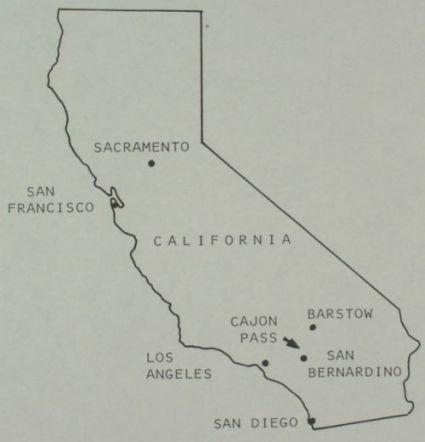 Cajon Pass is located in Southern California between San Bernardino und Barstow (actually Hesperia). The Pass is between the San Gabriel Mountains to the west and the San Bernardino Mountains to the east. The famous San Andreas Fault goes through that Canyon (Pass) as well. In the early days (1885), AT&SF (Santa Fe) and A&P (Atlantic & Pacific) built the first tracks over the pass. Starting at Summit, the downhill grade was 3 %. This is now known as Track # 2 (South Track). Later (1913), a second track was built by Santa Fe with a 2,2 % grade and it became Track # 1 (North Track). During the years, several minor line changes were made by Santa Fe. 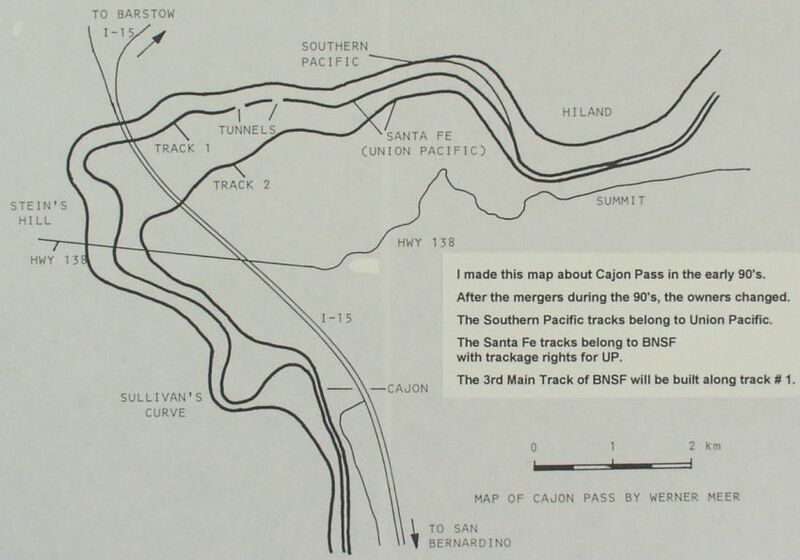 In 1967, Southern Pacific finished their Colton-Palmdale cut off over Cajon. From now on, we are having 3 tracks over the Pass. 2 tracks of Santa Fe with trackage rights for Union Pacific. During the mergers in the 90's, BNSF (1997) took over the owner ship but UP is still having trackage rights. Also UP took over the Southern Pacific (1996) and a connector was built between Track # 1 and the UP line in 1999. Now, in Summer of 2007, the Construction of the 3rd Main Track of BNSF has started. Track # 3 was built along Track # 1. It was finished in Fall 2008.